I’ve been following the efforts of Kim Burgas, Kimberly Kinchen, and Rod Huntress as they get the NYC Biketrain movement off the ground. I’ve even joined in on one of the Brooklyn rides. It’s a fun way to get to work and a safe introduction to bike commuting for anyone who might be a tad too nervous to try it alone. Plus, unlike a regular train ride, it’s all but impossible to sit next to someone clipping his fingernails. 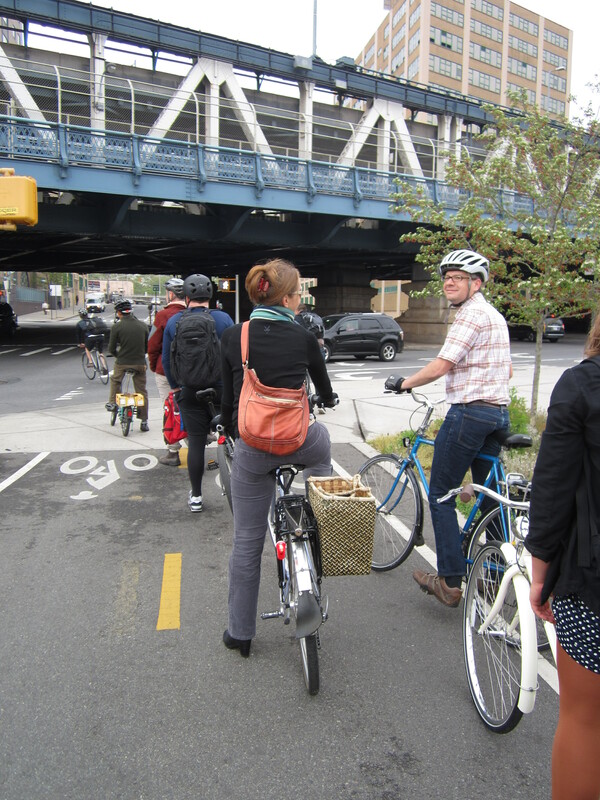 Rod Huntress sends in this description of the NYC Biketrain and the plans to keep it growing. I always wondered why New York City bicycle commuters so rarely talk to each other. We all share the same moments of sudden beauty, the same unrelenting traffic, the same fat and growing catalogue of bike lane obstructions. In short, we’re in this together. And what happens? We hit a red light and everyone stares silently into the middle distance, ignoring each other the way we would if we found ourselves riding the same New York elevator. The NYC Biketrain held its first breakfast last week at Red Lantern Bicycles in Fort Greene, Brooklyn. We talked, got our morning caffeine dosage up to acceptable levels and carbo-loaded with goods from Blue Sky Bakery. Then six of us took part in a bike ride into Manhattan. That’s a pretty good size for this kind of group commute – large enough for visibility, small and nimble enough to slip through the left-turning traffic along the protected bike lane on First Avenue. I led the ride (that’s acting as the “conductor” in bike train lingo), and a colleague from work played caboose. People broke off along the way to go to their jobs: at Union Square, at the UN, up into the far reaches of Midtown. More breakfast meetups are planned in the coming weeks, and a regularly scheduled Brooklyn bike rain will launch soon (there’s already one running two days a week from Upper Manhattan to Midtown). Bike trains on Bike to Work Day, May 18th, are also in the works. For now, the best place to keep track of NYC Biketrain is on Twitter at @nycbiketrain and at On Your Left. You can also send an email to nycbiketrain AT gmail DOT com.